I love my Tartine cookbook! I have another successful attempt at the galette recipe this weekend. The recipes are proven and definitely worth the investment in time and effort. The preparation and the assembly of the galette is time consuming. However, you will be rewarded by the end result. They are delicious! Cut butter into 1-inch cubes and put them in the freezer. Dissolve salt in water and chill them in the freezer as well for 10 mins. Measure all the flour onto a cool work surface, I work directly on my granite countertop. You can also work on a pastry mat for easy measurement. Spread the flour out into a rectangle about 1/3 inch deep. Scatter the butter cubes over the flour. Toss a little of the flour over the butter and dust your rolling pin with flour. Roll the butter out into long thin pieces with the rolling pin. Use a bench scraper to scoop up the sides of the rectangle so that it is again the size you started with. Repeat the rolling and scraping 3 or 4 times. Make a well in the center and pour all the chilled water into the well. Using the the bench scraper, scoop the sides of the dough into the center, cutting the water into the dough. Keep scraping and cutting until the dough is a shaggy mass, and then shape the dough into a rectangle about 10 by 14 inches. Dust the top with flour. Roll out the rectangle until it is twice as large and then scrape the top, bottom, and sides again to the original size and reroll. Repeat 3 or 4 times until a smooth and cohesive dough forms. You should end up with a smooth rectangular dough about the size 10 X 14 inches. Transfer the dough to a large baking sheet, cover with plastic wrap and chill in the refrigerator for 1 hour. Divide the dough into 12 equal portions of rectangular block. 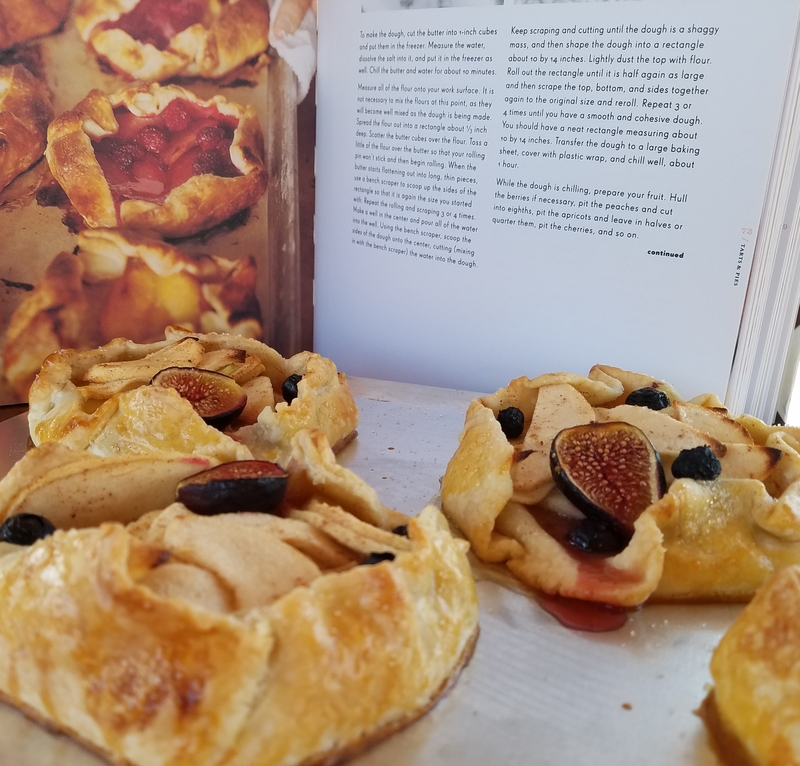 This recipe makes 2 mini galettes out of each block. Reserve the dough you want to use immediately in the refrigerator. Wrap the remaining dough blocks in cling wrap and store in a freezer bag. Keep them in the freezer until the next time when you crave for galettes again, it won’t be long 😊. When you want to use the frozen dough blocks, transfer them to the refrigerator the night before to defreeze the dough. For the amount of filling in this recipe, you only need 2 dough blocks. To prepare the galette, cut each chilled dough block into two equal square portions. Dust your work surface with flour. Position each square dough as a diamond in front of you. Roll each square dough from the center toward each end, only flattening the center, stopping short of the 2 points nearest and farthest from you. Rotate the dough a quarter so that the flattened points are nearest and farthest from you. Continue rolling until you have a flattened disc about 1/8 inch thick. Transfer to a baking sheet dusted with flour. Cover with a sheet of cling wrap. Chill in the refrigerator while you roll out the remaining dough blocks. Stack the dough discs on top of each other, separated by cling wrap. Chill in the refrigerator while you prepare the filling. Peel and core the apples. Cut into 1/8″ slices. 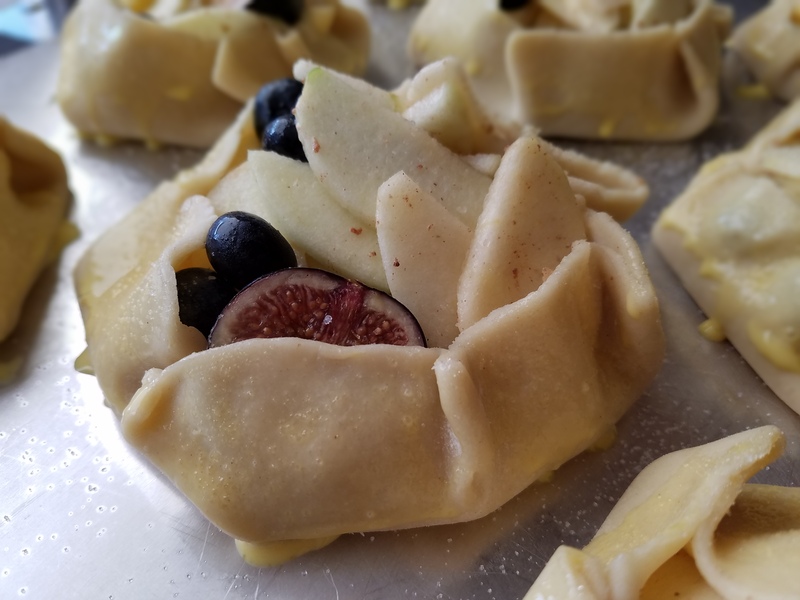 Mix apple slices with the remaining filling ingredients except figs in a mixing bowl. Cut each fig into halves. Assemble the galette no more than two hours before serving so that the dough do not get soaked with the juices from the filling. Take a dough disc out from the refrigerator. Mound 1/4 of the apple filling in the middle of the disc, leaving at least 1 1/2 inch border. Fold the edges of the dough disc up, pleating them so that they stay in place. 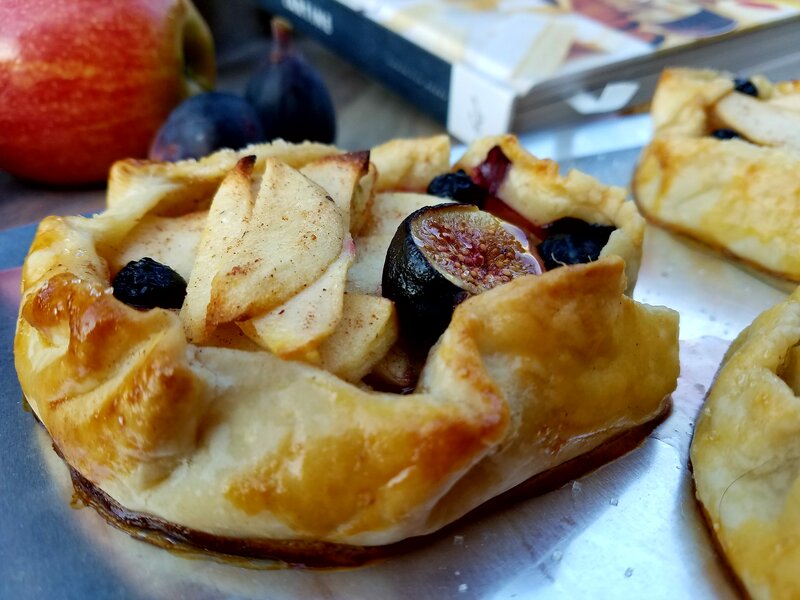 Garnish each galette with half a fig. Transfer to a baking sheet dusted with flour. Chill the galette in the refrigerator for at least 10 minutes until the dough is firm and holds its shape. Repeat for the remaining galettes. Prepare the egg wash by beating the egg yolks with the heavy cream. Remove the galettes from the refrigerator. Brush the dough with egg wash and sprinkle some sugar over the brushed dough. Bake for 40 minutes until the dough is golden brown.